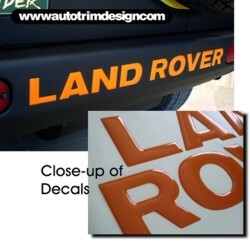 Detail your Freelander with these "Polyurethane Domed" decals that fit in the depressed area of your rear bumper. "Domed" decals are not just vinyl decals. They are a tactile, three (3) dimensional decal that looks like a factory manufactured emblem. Available in a wide variety of colors, they will look Great! Easy to follow online application and care instructions are included. Please note: Domed decals are made upon your order. We hold them for three days to allow doming to cure.